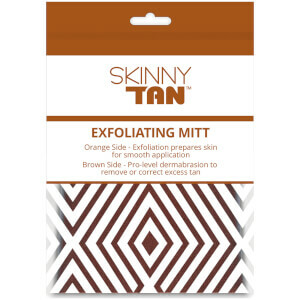 Prepare skin for flawless tanning with the SKINNY TAN Exfoliating Mitt; a gentle yet effective glove that ensures skin is ultra-smooth and ready for false tan application. Boasting a double-sided design, the mitt comprises a brown side, which provides gentle exfoliation to eliminate dead skin cells and rough patches of skin, whilst the tougher orange side utilises professional level dermabrasion that can remove excess tan from hands, ankles, knees or elbows. The versatile mitt ensures skin is ultra-smooth and the perfect canvas for self tan application. Expect flawless results to follow. Use the brown side for gentle exfoliation to remove dead, dull skin cells and create a smooth surface to apply tan to. The orange side has professional level dermabrasion tough enough to remove excess tan from palms, ankles, knees or elbows.